23.4.1934: The Board of Kingston Steam Trawling Co Ltd decided to exercise their option with Cook, Welton & Gemmell Ltd to build two more middle water trawlers to the same design as the AVANTURINE (Yd.No.542) but with amendments in respect of hull dimensions. Contracts were signed with the shipyard and with C. D. Holmes & Co Ltd to make the engines and boilers. The price agreed was £13,854 each vessel. 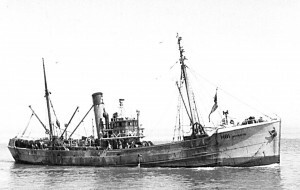 The names chosen were ARAGONITE and ACHROITE (The last of nine trawlers built to this design and also the last middle water trawler to be built for Kingston). Total cost for ACHROITE, with amendments, fishing gear and other equipment £14,808.2.0d. 30.6.1934: Launched by Cook, Welton & Gemmell Ltd, Beverley (Yd.No.596) for the Kingston Steam Trawling Co Ltd, Hull as ACHROITE. (Named by Mrs A. Bird wife of a director of Kingston). 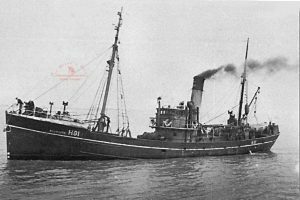 4.8.1934: Registered at Hull (H81). 9.8.1934: Completed trials and accepted, John William Lown, manager. 11.8.1934: Sailed on first trip (Sk. John Stephenson); ten crew. 1938: In Princess Dock, Hull. Boiler fitted with superheater by C. D. Holmes & Co Ltd at a cost of £1,474.18.5d. 15.8.1939: Sailed for Faroes grounds (Sk. W. Swain). 29.8.1939: Landed 940 kits grossed £764. 30.8.1939: Admiralty telegram advising that ACHROITE would be requisitioned (This left Kingston with only two trawlers AVANTURINE (H197) and EUCLASE (H384) fishing from Hull in armed convoys). 31.8.1939: Requisitioned for war service (Hire rate £188.8.0d/month). 1939: On St. Andrew’s dock slip fitted with bronze propeller and additional lifesaving appliances (carley floats). Cost £274.19.0d. 2.9.1939: Sailed Hull for Govan with an RN crew. Fitted out as a minesweeper by Alexander Stephen & Sons Ltd (1-12pdr) (P.No.FY.914). 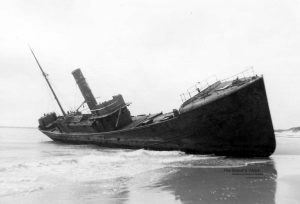 3.10.1939: Inspected at Troon after reportedly touching bottom in Sound of Islay; no damage found. 1940: Based Peterhead with M/S Group 19 (Sk. G. W. H. Mortlock RNR). 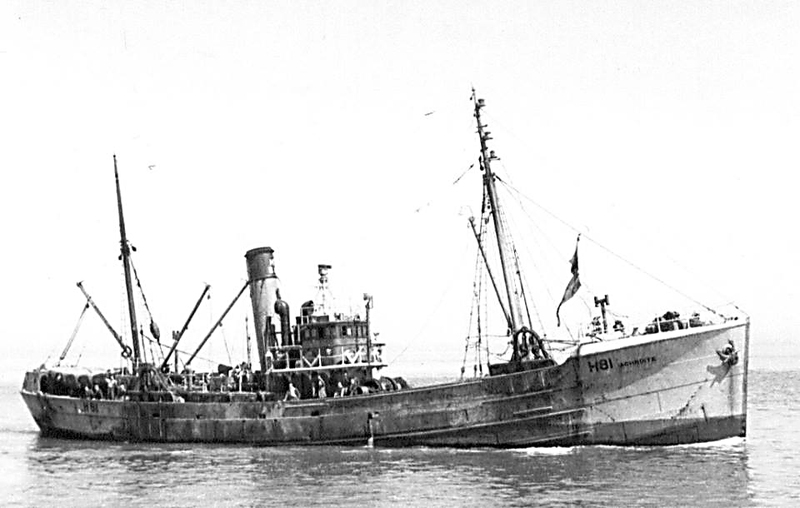 1942: Remained at Grimsby (Act. Sk. Lieut J. Stewart RNR). 15.1.1946: Arrived West Hartlepool for restoration by F. O. Kindberg (6 months due to shortage of materials and labour). 12.8.1945: Arrived Hull slipped for various work and Special. 21.8.1945: Sailed for North Sea grounds (Sk.W. Swain). 3.9.1945: Landed 791 kits grossed £2,722. 11.8.1949: Sold to J. Marr & Son Ltd, Fleetwood (Leslie James Marr, manager) for £35,000 en bloc with IOLITE (H372) for £37,500, total £72500. Fishing from Hull (Geoffrey Edwards Marr, Brough, manager). 1956: Geoffrey Alan Marr appointed manager. 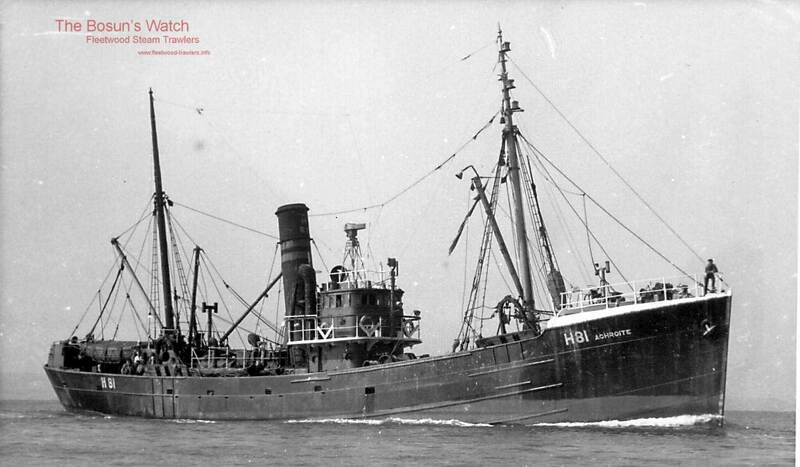 11.5.1960: Sold to The Cevic Steam Fishing Co Ltd, Fleetwood (Richard Neave, Thornton, manager). 1963: Sold to Haulbowline Industries Ltd, Passage West, Co.Cork. 4.2.1963: On passage Fleetwood-Cork had engine trouble(?) off Coninbeg Light-vessel and put in to Rosslare, Co. Wexford. 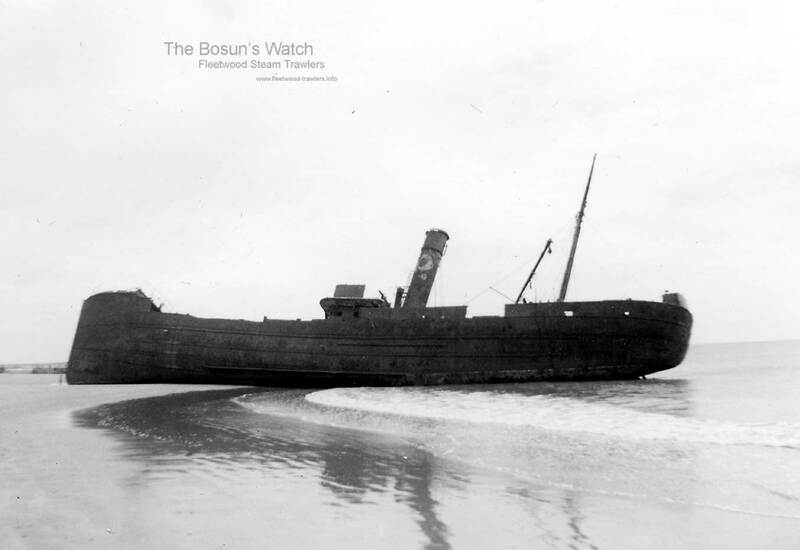 6.2.1963: Broke adrift and driven ashore on the Rosslare Strand, 5 miles north-east of Rosslare Light. Eight crew taken off. 10-11.2.1963: In a full storm driven further ashore ending up on beach 2 miles north of Rosslare. 28.3.1963: Hull registry closed “Vessel total loss”. 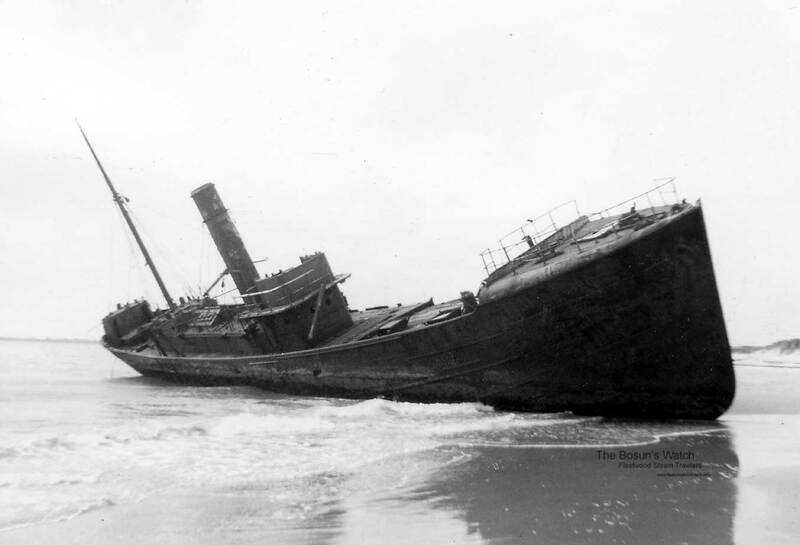 1963: Wreck sold to P. Roche, Killinick, Co Wexford, stripped of non-ferrous and other usable materials and abandoned. 1986/87: Dispersed by explosives but still visible when sands move. 28/01/2009: Page published. 7 updates since then. 24/09/201: Removed FMHT watermark from image. Added an image. This entry was posted in Lost Vessels, Steam Trawlers, Steamers (Picture) and tagged Cevic SFC, Lost, Marr on January 28, 2009 by Fred Smith.